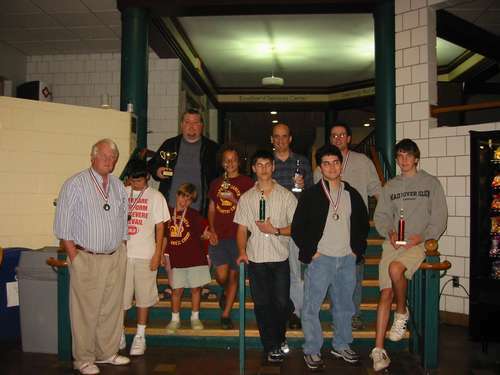 10.18.07 Ruben Babayan scored three points at the Maine Open on October 13, 2007 at Southern Maine Community College to tie for first with Andrew Tichenor, Lucas McCain and Derrick Crocker. 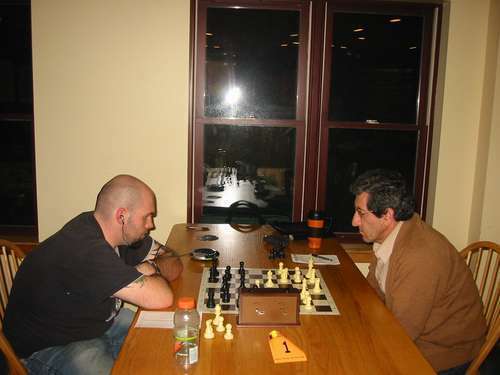 With this win Babayan becomes the 2007 Maine Chess Player of the Year. Congratulations Ruben! John Bapst High School student Aaron Spencer won the U1600 section and Scott Overlock and Reed Wommack shared first in the Rated Beginners Open section. Thanks to Dan and Ilene Fishbein and Phil Lowell for contributing to this report. What separates great players from merely good ones is consistency--the ability to perform at a high level week after week and month after month. 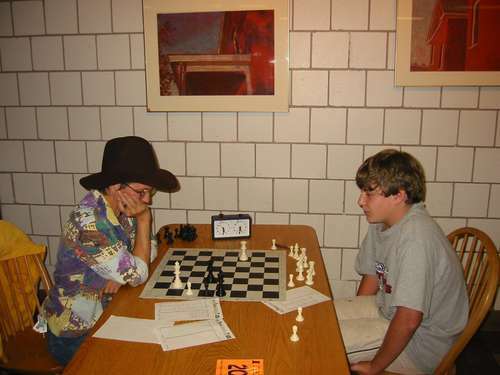 Expert player Ruben Babayan of Portland certainly demonstrated his consistency over the course of 2007 by playing in and being in contention for all seven Maine Chess Player of the Year events. 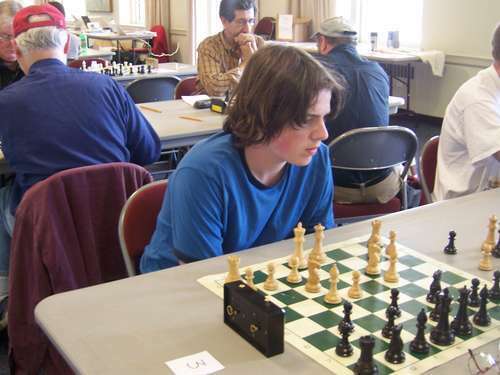 In addition to sharing first in this year's Maine Open, Babayan finished the year with forty-five Maine Chess Player of the Year points (points are awarded for each game played and added to the player's tournament score) to take first place in the year-long competition. 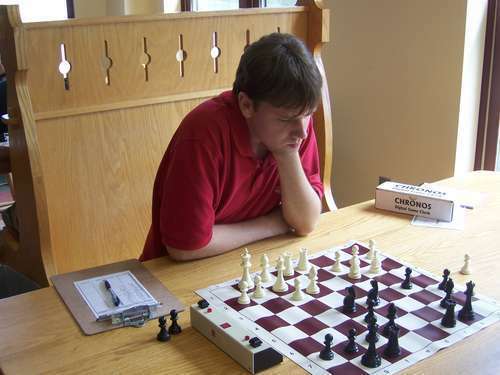 A full run-down of the final Maine Chess Player of the Year standings are coming soon. Joining Babayan at the top of the Maine Open crosstable were fellow expert Andrew Tichenor (2030), Lucas McCain (1808) and Derrick Crocker (1660). In the Reserve (U1600) section Aaron Spencer (1318) led the field with 3.5 points followed closely by Saco Valley's own Denis Nadeau (1493), Nicholas Parsons (1356) and Michael Dudley (1329) all of whom scored 3.0 points. 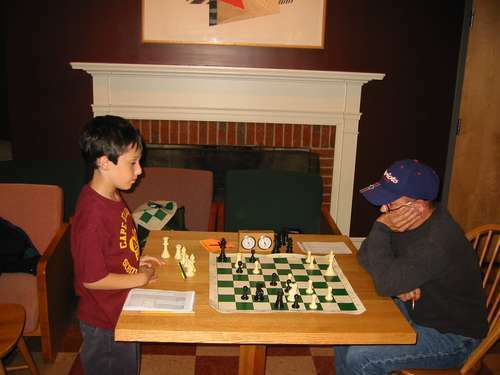 Continuing his winning ways, Scott Overlock (1050) shared first in the Rated Beginners Open (U1200) section with Reed Wommack (1016), both scoring 3.5 points and drawing their last round game with each other. On their heels in third with 3.0 points was Brandon Greaton (930). Aaron Spencer (left) takes on Nicholas Parsons in the final round. Spencer won this game to take first in the U1600 section. Matthew Fishbein and Denis Nadeau tangle in the third round. 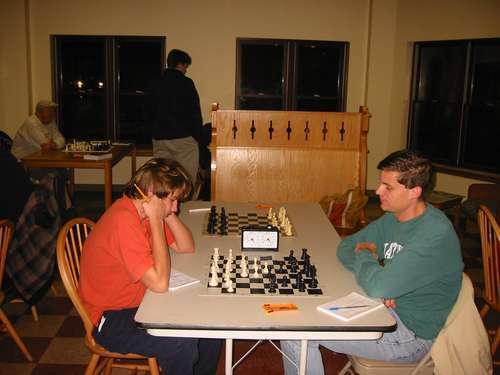 The exciting finish of the Rated Beginners Open section: Scott Overlock (left) and Reed Wommack play to a draw. Sara Dinyari and Daniel Epstein play out the endgame in round four of the RBO. 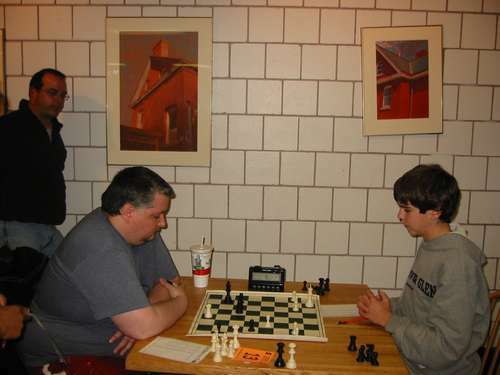 The 2007 Maine Open was organized and directed by Maine Chess Association President Phil Lowell. A great site. Congrats on winning the Best State Website for the year!! Once again, you've done a fine job of reporting, particularly the photo coverage...the only thing missing is your name in the crosstables. Babayan almost chased me out of the room because I was talking.